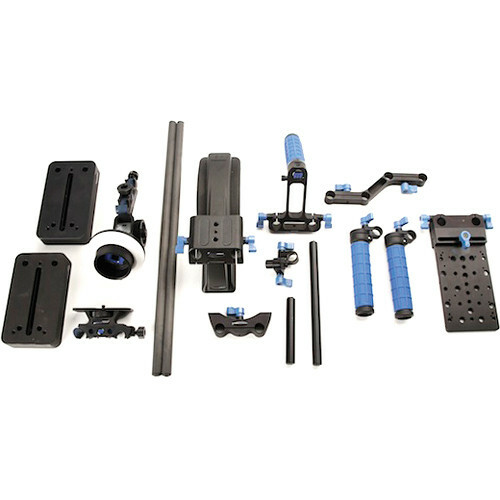 The Redrock Micro Universal Shouldermount Bundle with microFollowFocus Black allows you to create new or reconfigure standard rigs depending on the specific requirements of a shot or your shooting style. The different components are eyeSpy Standard, eyeSpy Balance, eyeSpy Deluxe, and Field Cinema Bundle. It contains all the components required to build different rigs for HDSLR and video cameras. In addition to giving you the freedom to choose any rig, you can also enhance, accessorize, and add-on to your existing rig. With the eyeSpy Standard Bundle, you can create customized shoulder-mounted DSLR rigs. The bundle comprises two 18" (46cm) 15mm carbon fiber rods, two 9" (23cm) 15mm carbon fiber rods, a padded shoulderpad with rod clamp, microHandGrip, DSLR baseplate, rod offset kit, and the microFinder loupe accessory. Its microLink4 offset assists focusing by positioning the camera and any viewfinder up to the operator’s eye, blocking sunlight and providing magnification. The eyeSpy Balance Bundle can be used to create ergonomic shoulder-mounted DSLR rigs. It comprises all the components of the Standard Bundle and an additional microBalance counterbalance starter kit with one extra weight. The counterbalance weights provide added stability for mid-range shooting. In addition to all the components of the Standard Bundle, the eyeSpy Deluxe Bundle comprises the microBalance counterbalance starter kit with one extra weight and the microFollowFocus Black. The counterbalance weights provide stability while the follow focus improves focus precision, making it suitable for shoulder mounting of DSLRs. With the DSLR Field Cinema Deluxe Bundle you can convert your video DSLR into a cinema production rig. It is composed of a DSLR baseplate, 18" (46cm) carbon fiber rods, microShoulderPad, handlebar rod clamp with 2 grips, microFollowFocus Black, microBalancePlus with two microBalance counterbalance weights, microHandle top handle, and the microMount. The Field Cinema Deluxe Bundle is designed for DSLRs that can send HD videos to an external monitor while shooting, and is compatible with most video DSLRs such as the Nikon D90, D300s, D3s, Canon 7D, 1D Mark IV, and 5D MKII. The HD monitor provides the Camera Assistant with access to camera focus in addition to the operator. Box Dimensions (LxWxH) 17.9 x 14.9 x 8.3"